Hi and welcome to the first post of my blog! My name is Jessa and I am a senior Psychology major at Dominican University of California. This is my story on how I connected to Ambassadors of Hope and Opportunity (AHO), Marin’s only nonprofit serving youth who are homeless or at-risk with comprehensive support and leadership opportunities, so they receive the resources a parent would typically help with and more. AHO provides leadership opportunities and the resources, emotional support, and caring they need to achieve their educational and life goals. It was the beginning of the semester and I was scrambling to find an internship. I had roughly two weeks to get one otherwise I was going to be dropped from one of my required classes. As a second semester senior, you could imagine how stressed I became at the thought of not being able to graduate this semester and falling deeper into debt. Time was ticking. All of the organizations I emailed and called seemed to be too busy to get back to me, until I contacted Ambassadors of Hope and Opportunity. 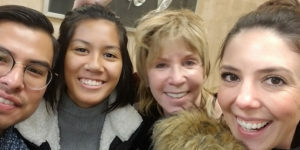 My professor, LeeAnn Bartolini, PhD, connected me to the founder of AHO, Zara, who immediately got back to me and was ready to meet within the next couple of days. Prior to our meeting I went onto the AHO website to learn more about what this nonprofit did and how they help homeless youth. I was amazed at how youth-driven the organization was especially with the success of its youth-led projects. After reading about AHO’s approach to helping homeless youth I grew excited to potentially work with them and be a part of this impact. I met with Zara on January 29th at the Depot Cafe. As we sat drinking our coffee, or rather tea for me, she asked me what I wanted to do after I graduated. I told her I was still figuring that out, but I knew that I wanted to work with adolescents and young adults. Initially my plan was to become a therapist and go to graduate school right after receiving my Bachelor’s degree. At some point in my college career I decided that I wanted to wait on becoming a therapist, and focus more on the prevention of poor mental health. I became interested in the nonprofit world and working directly with youth, and as many youth as possible, in a way that was affordable but just as impactful as therapy. This was when Zara told me that this internship would be perfect. We spent the rest of the meeting talking about AHO’s mission, new youth-led projects being developed, and AHO’s model. As I was listening to Zara speak, her passion and enthusiasm to make a difference for the homeless youth population in Marin county was recognizable. There was one thing she said that stuck with me when she was telling me about how the AHO model was not like any other model. She told me something along the lines of not using or liking the term ‘case management’ because it framed the situation and the person as a “case to be managed.” I completely agree with that statement. People are not cases to be managed. For this reason, AHO youth are paired with an adult ally coach to assist them with the goals they wish to achieve. I knew then that working with Zara and AHO would be an amazing opportunity. Coincidentally, we met on my birthday and our meeting ended with the greatest birthday present I could’ve hoped for– an internship! I look forward to the opportunities and growth this internship will bring me. If you’re a youth looking for assistance don’t be afraid to reach out to AHO, and if you’re someone who needs college or internship advice don’t be afraid to reach out to me.